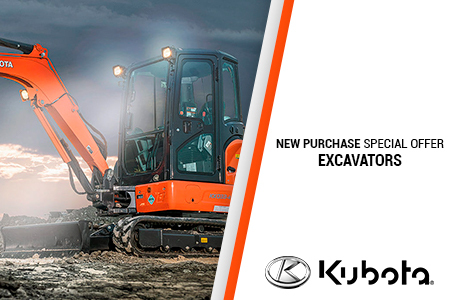 Kubota V2607-DI Engine: The KX057-4 is powered by Kubota's impressive 49.5 HP direct injection engine. Engineered with the power to maximize digging and lifting performance, it also delivers minimized noise, vibration and fuel consumption. Hydraulic Angle Blade (Option): Save time and work more efficiently. With a simple movement of a rocker switch on top of the dozer lever, the hydraulic angle blade can be angled to the right or left to push soil to the side as the machine moves forward, eliminating the need for repetitive repositioning at right angles when backfilling trenches. Auxiliary Circuit 1 (Standard Equipment): Controlled by the right-hand joystick, AUX1 supplies 19.8 gpm to operate attachments requiring hydraulic flow, like a breaker, thumb, or tilt bucket. 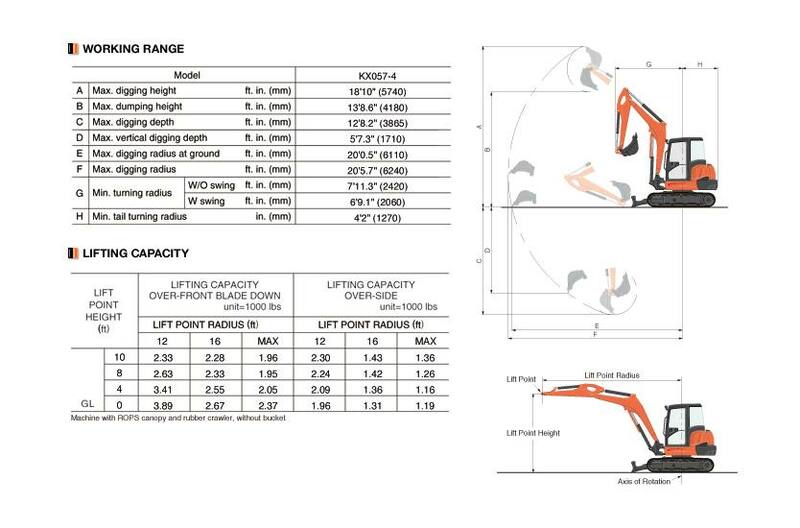 Stronger Bucket and Arm Breakout Force: The KX057-4 delivers an impressive bucket digging force of 11,177 lbs. Its powerful and well-balanced arm and bucket allow the operator to dig faster and more efficiently even in the toughest conditions. 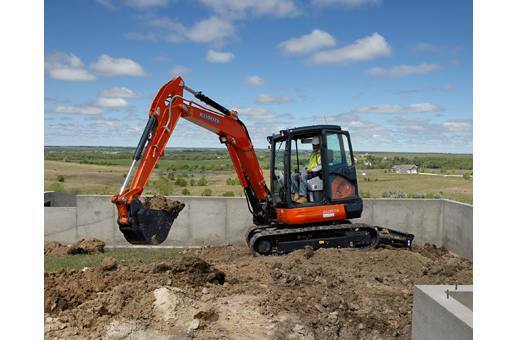 Wider, More Comfortable Cabin: The KX057-4 features a much wider door and ample foot space, making it a breeze to get on and off the excavator. Wider Working Range: A wide and powerful reach coupled with outstanding stability makes it possible to undertake a wider range of operations. The wide and powerful reach coupled with outstanding stability significantly reduces the need to shift position. The greater digging height means that operations- even from an elevated position- are handled with impressive efficiency. 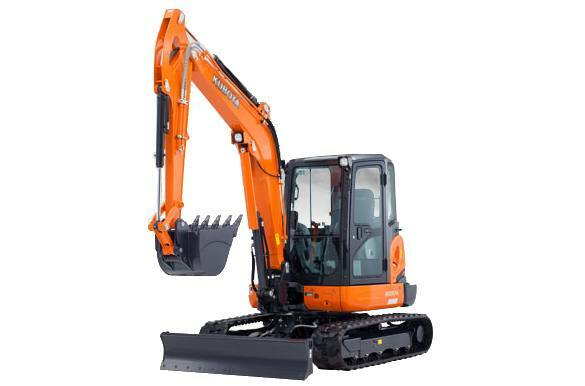 Deluxe Suspension Seat: Kubota's high-back suspension seat has been designed for maximum operator comfort and to minimize fatigue during extended machine operation. The deluxe reclining seat offers weight compensation, firm adjustable wrist support and retractable seat belts. ROPS/OPG (Top Guard) Canopy and Cabin: The OSHA-certified ROPS/OPG (Top Guard) canopy and cabin provide protection in the event of accidental rollovers and falling objects.